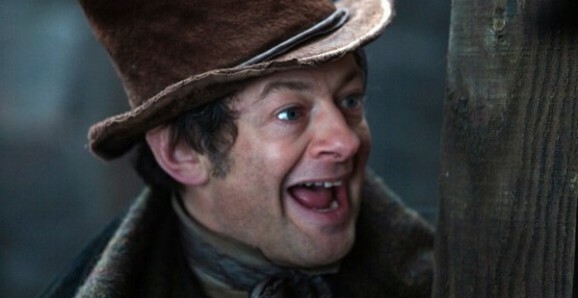 We know that Serkis’ voice is the one heard in the trailer for The Force Awakens. Star Wars Underworld has a source that claims that this character (again, we’ve heard that he could be playing two) has a grotesque, harrowing appearance, saying he looks like a zombie, like an old man who has “risen from the dead.” That’s a suitably creepy vessel for that sinister sounding voice. This character is reportedly being called Uber at the moment, though that could possibly change. The post references how Ridley’s character was being called Kira, and we know how that turned out. It also mentions how Lupita Nyong’o’s is similarly called Rose, and so we can probably expect both that and Uber to change eventually. Uber, whoever he is, sounds like he’s high up on the food chain, and “potentially is the Master pulling the strings from behind the scenes.” He reportedly communicates with both Adam Driver and Domhnall Gleeson’s characters. Driver, it is said, plays a Sith character, and all three are part of the new version of the Empire, which, according to other reports that have surfaced, is still out there, but on the periphery and in a diminished capacity. Gwendoline Christie’s character also belongs to this Empire, and it is again stated here that she is one of the new Chrome Troopers. Another earlier report said that these new stormtroopers may be part of Driver’s protection detail, and that certainly seems possible if these connections all turn out to be true. That’s quite a bit to chew on. As usual, this report jives with some of what we’ve heard, but contradicts other information floating around. In the end, we wind up with more questions than answers, but considering we’re still more than a year away, do we really want to know everything there is to know? Star Wars: The Force Awakens opens everywhere on December 18, 2015.